of epidemiology that are specific for infectious diseases and provides insight into the epidemiology of some classes of infectious diseases characterized by their main modes of transmission. This choice of topics bridges the gap between scientific research on the clinical, biological, mathematical, social and economic aspects of infectious diseases and their applications in public health. 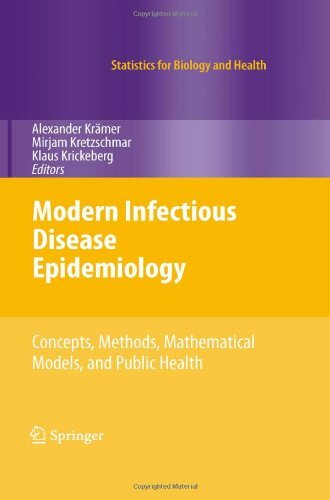 The book will help the reader to understand the impact of infectious diseases on modern society and the instruments that policy makers have at their disposal to deal with these challenges. It is written for students of the health sciences, both of curative medicine and public health, and for experts that are active in these and related domains, and it may be of interest for the educated layman since the technical level is kept relatively low. Heidelberg University in 2000. In 2007 he received his Ph.D. in Public Health from Sapporo Medical University, Japan.Frauke Kraas is Professor and Chair of Human Geography at the University of Cologne since 2000. She holds a PhD (1991) and a Habilitation (1996) in Geography from the Universities of MÃ¼nster and Bonn where she worked as Research Fellow and Assistant Professor from 1987 to 2000. She was awarded the Gerhard-Hess-Price (1997) and the Heisenberg Postgraduate Scholarship (1998) from the German Research Council (DFG).